I must confess this is not my writing desk. 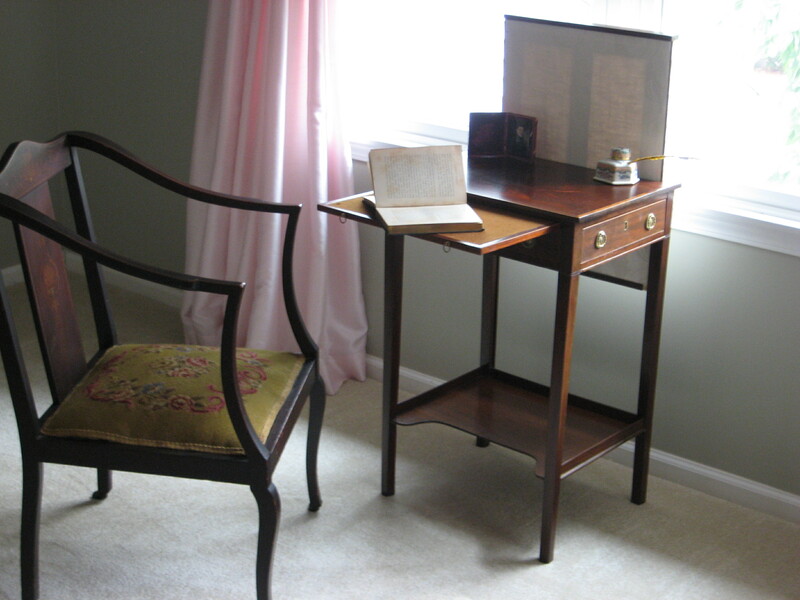 While it is in my home and I adore it, the English Georgian writing table is much too small for me to use as my primary desk. For Jane Austen, however, it would have been ideal. Her desk was about the same size. In 1809 Jane Austen moved to Chawton Cottage in Hampshire with her mother, her sister Cassandra, and Martha Lloyd. 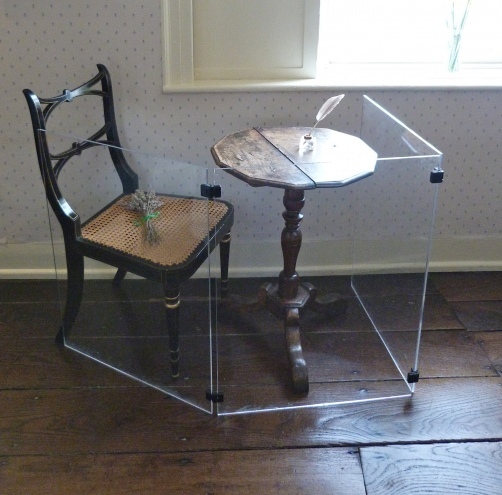 If you visit Chawton Cottage, you’ll see the small twelve-sided walnut table Jane Austen sat in front of when she revised Sense and Sensibility and Pride and Prejudice. 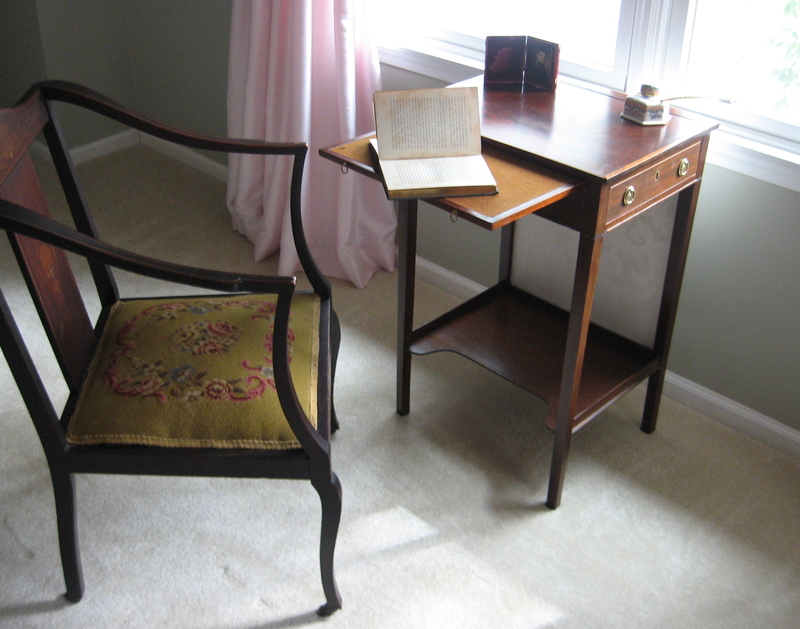 It’s also from this table that Jane penned Mansfield Park, Emma, and Persuasion. As was the custom of the day, she would have used a writing slope on top of the table. Inside her slope she would have keep her quills, inkpots and paper. Many also have hidden compartments. This Georgian era writing slope is one of mine. According to A Memoir of Jane Austen by her nephew, James Edward Austen-Leigh, Jane’s table was located in the general sitting room of the house. This room had little privacy but, thankfully for Jane, it had a creaking door. Jane never wanted this door to be fixed since it warned her of any approaching visitors. Once she heard the door creak, Jane would hide her manuscript before anyone could see it. My writing table has an interesting feature that I think she would have appreciated. When I stumbled across this mahogany table at my favorite antique shop, I fell in love with this little treasure dating from the Georgian era. It has one drawer, and a writing surface covered in felt slides out of the front. While I was inspecting the piece, I discovered a silk brocade-covered panel on the lower back of the table that slid up and down. The owner of the shop was away at the time, and unfortunately his assistant couldn’t tell me anything about this feature. With additional research I discovered a face screen was a useful feature. If you were sitting too close to the hearth, you could raise the face screen to shield yourself from the high heat of the fire. Keep in mind during the Georgian era, many women and men wore makeup. A handy way to prevent your face from melting was to raise the face screen. I also think Jane Austen would have liked the feature to prevent prying eyes from reading her works in progress. 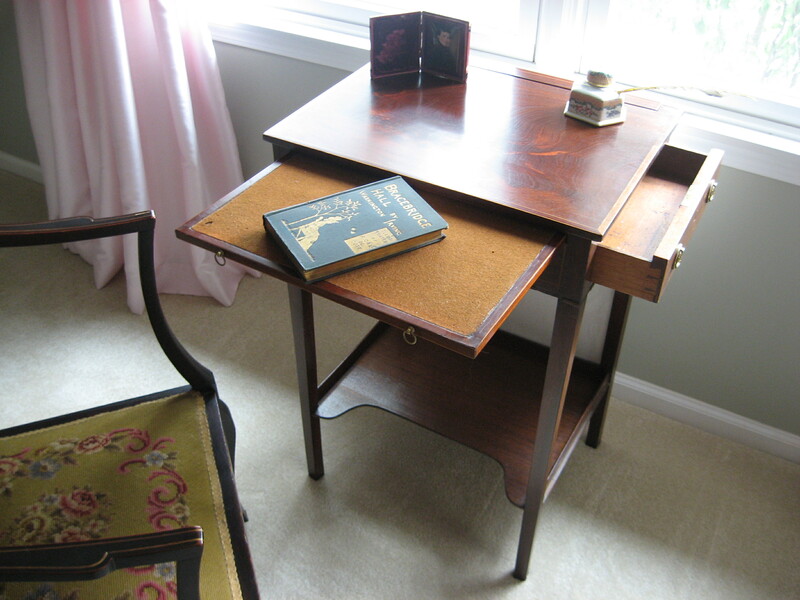 Really like the writing table, what a great find!